Our biggest compliment occurs when another doctor, healthcare provider or patient refers Dr. Hani AlSaleh and AlSaleh Dental Center to another great patient like you. We are looking forward to meeting you! The first step is to schedule your complimentary AlSaleh Dental Health Consultation to see how we can further help you with your dental health. 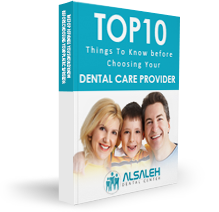 At AlSaleh Dental Center, we understand that switching to a new dentist, or finding a new dentist in Martinsburg, WV can be a worrisome task. You want to find someone who is professional, has a modern state-of-the-art dental office, offers exceptional results and all of the dental services that you could need or want in a friendly atmosphere. We believe we exceed that standard. Whether you are seeking a Martinsburg or Inwood, West Virginia (WV) family dentist, cosmetic dentist, emergency dentist or pain-free dentist, Dr. Hani AlSaleh and his dental team are here to provide you the most enjoyable dental visit you will ever have! Call us now at 304.267.8702.